In bustling Chinatown are several small streets where Singapore’s hip and happening restaurants are located. Shophouses line these tiny streets and one after another, they have been dolled up on the outside and restored on the inside for the many young chefs starting out. Created by Jason Atherton, a Gordon Ramsay alum from Verre in Dubai and Maze in London, this tiny tapas bar headed by Andrew Walsh has been serving Spanish-inspired small plates since it opened in 2011. Getting a much-coveted stool at the communal bar was a challenge which is why we never risked a Friday evening dinner there as we never knew how long the wait would be. 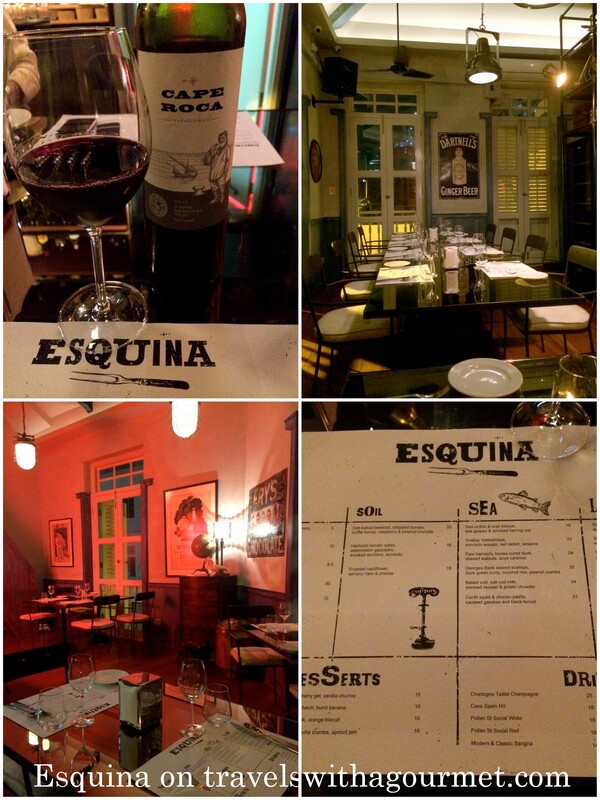 Recently, they opened a second floor dining space – Esquina 2.0 – which accommodates about 25 diners and we were lucky enough to snag a table here on a weekend evening. 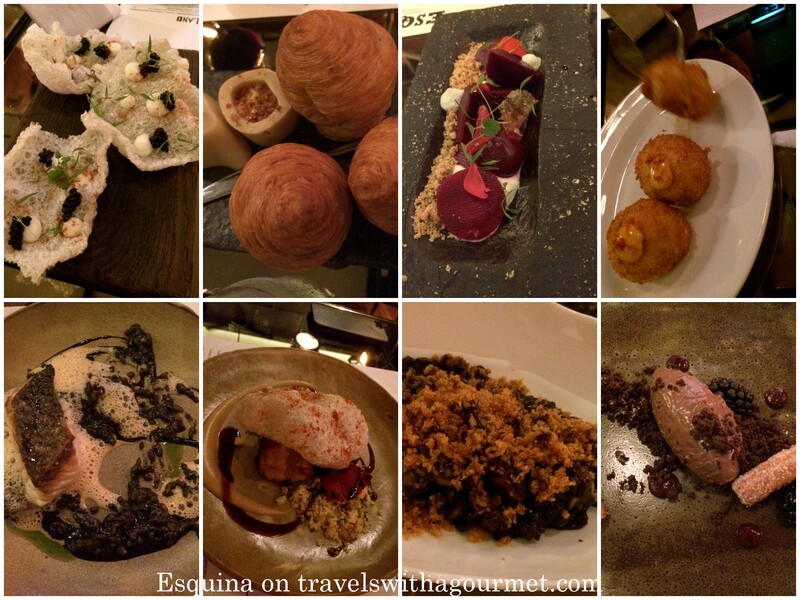 The Esquina menu is printed onto a simple paper placemat and divided into six sections: Snacks, Soil, Sea, Land, Desserts and Drinks with each section listing about half dozen choices. On that evening, there were three of us for dinner and we shared many small plates, making sure to order a few from each section. We started out with a bottle of Cape Roca Fisherman Tejo red along with a couple of Snacks: the warm thyme and onion bread served with smoked bone marrow butter (individual popover-like rolls were served with a couple of bone marrows which we slathered onto the hot bread), the pork crackling, salt cod and smoked herring roe – a modern version where pork crackling seem like a large cracker (like a pork krupuk) topped with several dots of salt cod mousse and roe – this was more form than substance, it tasted fine but was a bit too much for so little and the classic jamon croquetas – no tricks here, just the usual breadcrumbed creamy béchamel with jamon Iberico bits. From Soil, we had the salt-baked beetroot with whipped burrata, truffle honey and a raspberry pine nut crumble – thinly sliced beetroot over creamy bur rata made smoky sweet from the truffle honey – exceptional flavors which made modern with the addition of the raspberry pine nut “soil” (full disclaimer – I’m not a fan of endless foams and soils in food). From Sea, we had the and excellent seared sea bass with the chorizo black paella and some kind of foam (could it have been olive?). From Land, the roasted duck breast with carrot escabeche and tarragon citrus couscous topped by another pork “krupuk-style” crackling and the roasted lamb loin with sweet garlic puree, salsify and broad beans which we shared a large side of chorizo paella with chorizo “soil”. For Dessert, we had the chocolate mousse with chocolate soil (again) and vanilla churros along with a Manchego cheese custard, black olive, brioche crumbs (more soil) and apricot jam. All in all, an enjoyable meal. I just wish they didn’t overdo the soils and foams. Often, food can still be fun without being overly-gimmicky.